While Republicans stressed that Congress deserve to hear all of the facts about the failed “Fast and Furious” operation, Democrats accused Republicans of unfairly targeting the president’s attorney general in an election year to score political points with their voters and with the National Rifle Association gun lobby that urged lawmakers to vote for the contempt resolutions. House Minority Whip, Democrat Steny Hoyer expressed his outrage. “I believe that the political motivations behind this resolution are clear, and pose a clear and present danger to this nation,” said Hoyer. Republican Darrell Issa, Chairman of the House Committee on Oversight and Government Reform, pushed for the contempt vote. Issa has conducted an 18-month investigation into “Fast and Furious” – a failed sting operation in which federal authorities allowed U.S. guns to flow into Mexico as part of a plan to identify and dismantle arms trafficking networks. Two of the guns were found at the scene of the shooting death of a U.S. border patrol agent. Issa did not accuse Attorney General Holder or President Obama of knowing about the gun-walking operation or of a cover-up. But he and other lawmakers demanded that Holder release more documents in the case than the Attorney General was willing to disclose. President Obama invoked executive privilege – a power used by the Executive Branch of government to deny requests for documents or to reject subpoenas. A citation for contempt of Congress has symbolic importance, but its impact is limited because the Executive Branch controls prosecution decisions. And in this case, that means the Justice Department. 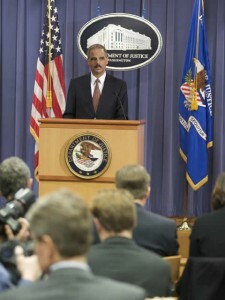 Experts says it is highly unlikely that one of Holder’s employees at the Justice Department would put his or her boss in front of a grand jury for prosecution, especially because President Obama has asserted executive privilege over the release of the documents.